1. A well-crafted bar tool set with a vintage flair ~mint~ to be with your dad. Get it from Williams Sonoma for $89.95 or from Sur La Table for $90. 2. 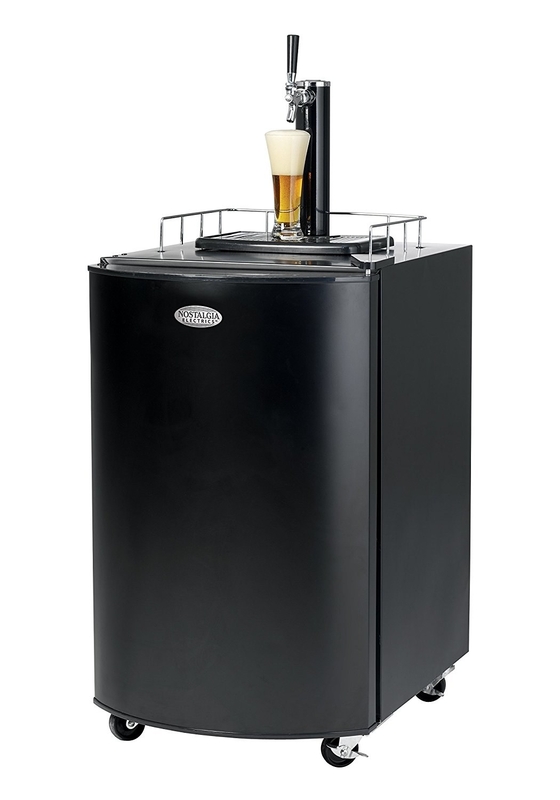 A full sized kegorator that'll dispense all the craft beer a dad could want. Get it from Amazon for $406.95. 3. A DIY home-cured bacon kit for anyone who loves bacon enough to try making it at home (it's easier than it sounds)! Just add pork belly, and homemade maple-cured bacon is only a week away. Get it from Sur La Table for $19.95. 4. And a smoker box so your favorite father can smoke that homemade bacon on the grill. Get it from Williams Sonoma for $49.95. 5. 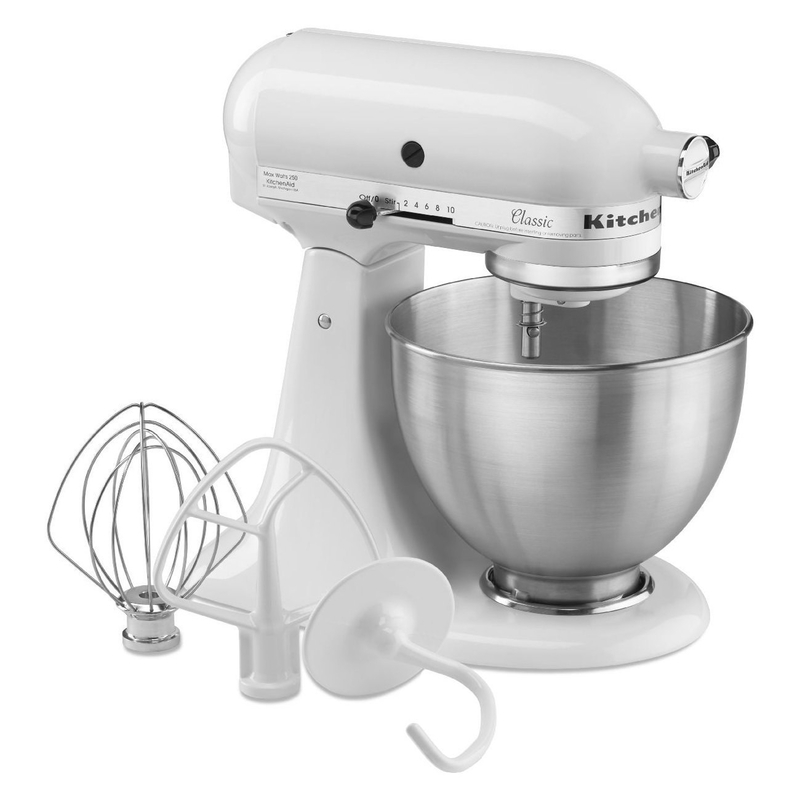 A 4.5 quart Kitchen Aid mixer worthy of a cookie baking monster. 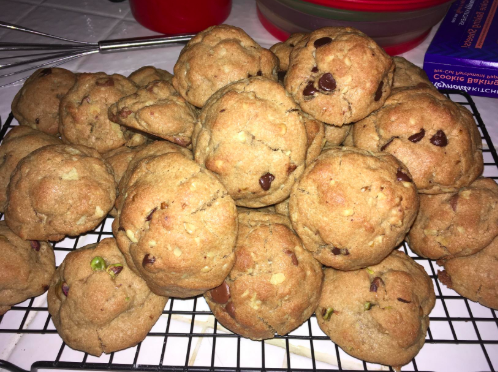 It can also knead dough, make mashed potatoes, and even grind up some beef for sliders! 6. A home brew kit perfect for a *crafty* dad. It has everything one needs to get started: gear for racking, measuring, sanitizing, and bottling. Get it from Man Crates for $169.99. 7. A monthly jerky subscription that just may ~raise the steaks~ on what qualifies as the most tasty jerky. Idk about your dad, but my dad is obsessed with jerky, but also complains about how pricey the good stuff is. Big need. Why you'll love it: This jerky subscription lets you try different jerky flavors every month from a different jerky master, and all the jerky is free of MSG, nitrates, nitrites, and high fructose corn syrup. 8. A 14-piece stainless steel cookware set guaranteed to please the home chef that only cooks with the best. Get it from Walmart for $239.98. 9. Or, gift this 11 piece non-stick set from Tasty so there's not a single worry about sticky situations. 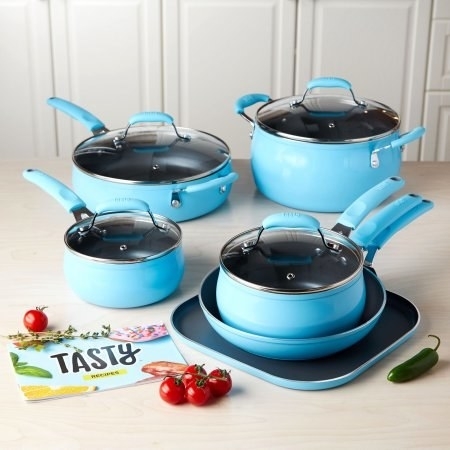 Get it from the Tasty Collection on Walmart for $99 (available in three colors). 10. A drool inducing monthly cheese subscription you *feta* give to your cheese-loving dad. TBH the only thing my dad loves more than jerky is cheese. What you get: Three different cheeses a month from creameries and farms around the country. Check out a previous month's cheeses here. Why you'll love it: You'll get to try delicious cheeses you have never heard of from places you've never been to, all from the comfort of your home! Get it from Murray's for $75 a month for a month-to month subscription, or $275 for a four month subscription. 11. And a fancy but practical cheese board ideal for a ~gouda~ picnic or cheese and wine night. Time to show off that cheese subscription! 12. A mini fireplace made of birch wood (and a removable glass barrier) dad can use outdoors or indoors to add ambience to all the meals. Get it from One Man Garage on Etsy for $29+. 13. A s'mores maker to ensure dad and the kids have ~s'more~ fun on the next rainy day inside. 14. 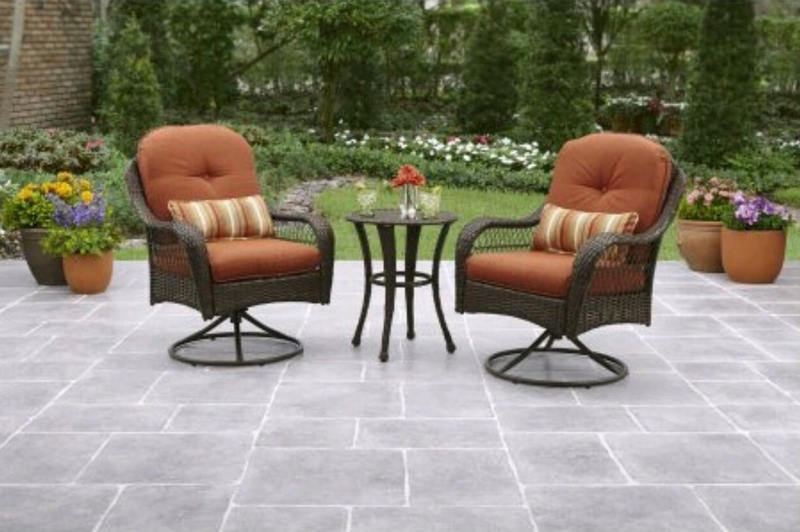 A three piece bistro set with gorgeous hand woven wicker so dad can eat outside like a luxurious king. 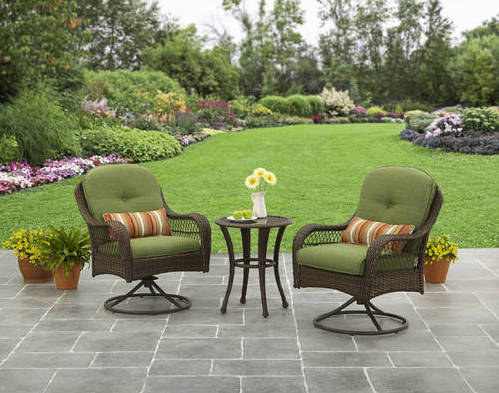 Get it from Walmart for $239 (two colors). 15. A 70 qt cooler to survive your very chill dad's not so chill beach trip. 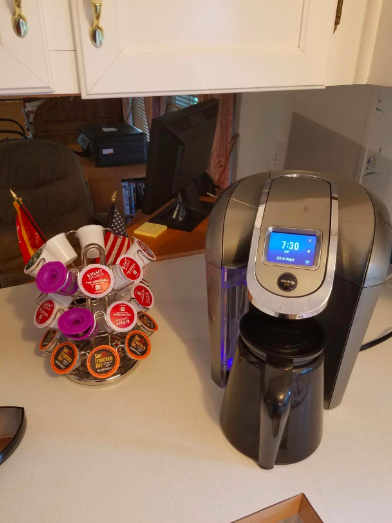 Features: holds 100 cans of soda, no-crush comfort handles for easy, pinch-free carrying, hinged lid with four molded cup holders, have-a-seat lid supports up to 250 lbs. 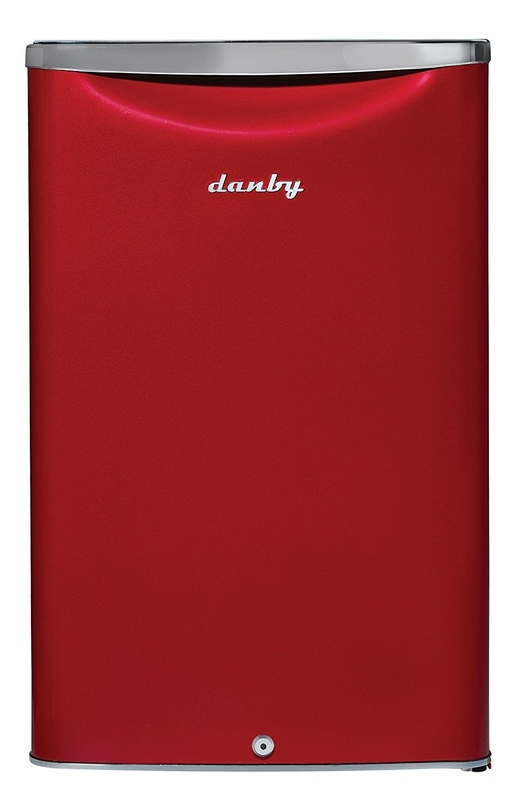 Promising review: "Excellent cooler! I had it on a front cargo rack on my jeep loaded with food and ice. It was August at the beach. On the second day I bought another bag of ice, and was surprised to see the bag of ice from the day before was still mostly frozen. I drove home (eight hour drive) without adding more ice. Two days later, still had ice in the cooler. I highly recommend it!" —John D.
16. 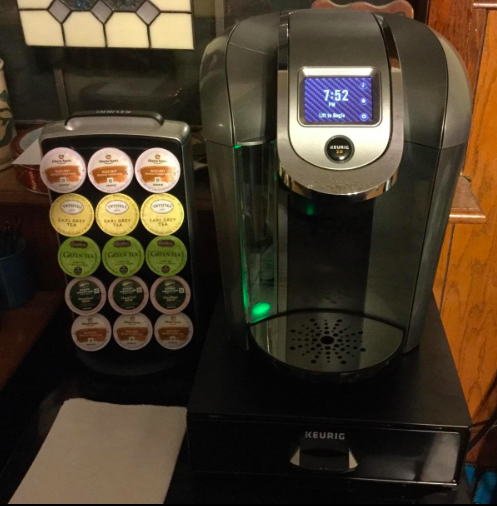 A new Keurig capable of making single cups and whole carafes of coffees in various strength to *Keurig* your dad of the caffeine crankies. 17. A Joule Sous Vide cooker to effortlessly cook the most *eggcellent* poached eggs, steaks, pork chops, lamb, and more. Truly the *Joule* of the kitchen. Get it from Amazon for $179+ (in white or white/stainless steel). 18. 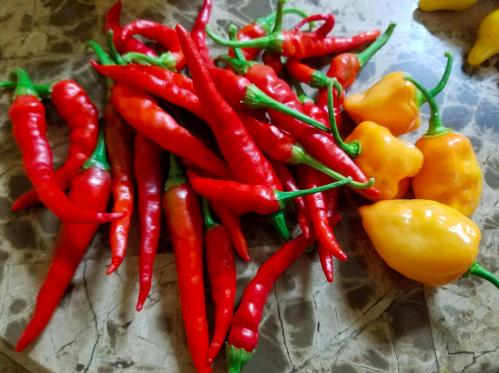 A packet of organic cayenne pepper seeds for anyone who wants to add homegrown heat to their cooking. 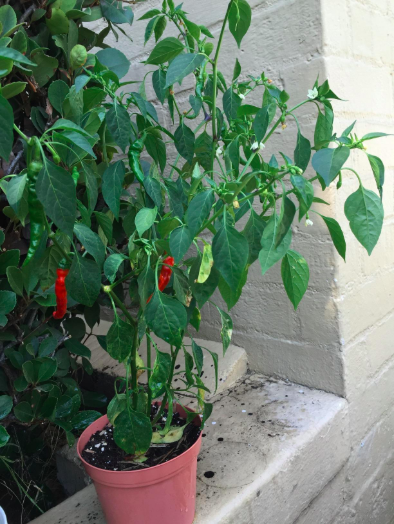 Get them from Amazon for $1.88 (100+ seeds). 19. A burger press and slider basket set specially designed to make perfectly crafted burgers at the BBQ. Get it from Sur La Table for $28.76. 20. And a splurge-worthy propane grill that just may be the finest grill your dad will ever own. 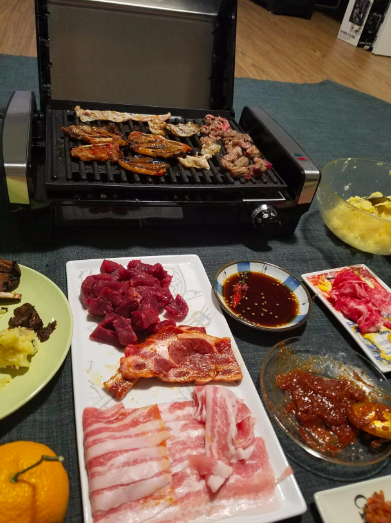 Promising review: "I have been grilling for over 30 years now (not continuously) and I have to say, this is the finest grill I've ever owned. Over the decades I have always opted for the $350 price point grills. I constantly experienced burned out burners, rusted components, and poor engineering. 1) Heavy duty main fire box. You know how the water quickly evaporates off the top of your cheap grill as it heats up? Well, this grill is so heavy duty that it actually contains the heat – what a concept. The rain droplets won't evaporate off until the grill is over 450 degrees. 2) The drip guards are designed to be steeply pitched, so instead of that flat surface that catches the grease and then catches on fire and burns your chicken, it actually channels it away. 3) The slide in base of the fire box is also steep, so that it actually channels burned stuff, grease etc. down into the catch pan. (Unlike the nearly flat base of the $350 grills). Again, this avoids the periodic grill fire when that detritus finally catches on fire and burns off. 4) Electronics for the starters are mounted away from the heat – so they don't burn up in the first three months of ownership. 5) Burners have holes in them that do extend forward and backward enough to make the entire grill surface usable – they aren't lying about this. Get it from Amazon for $899 (four colors). 21. And a ceramic grill grid that'll handle all the veggies a man can eat. Get it from Sur La Table for $31.96. 22. 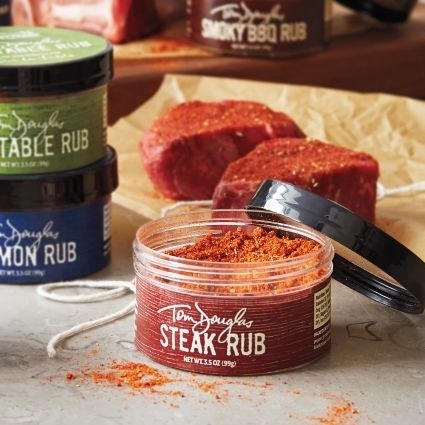 A savory meat rub and button thermometers to ensure Father's Day is filled with expertly cooked steaks. 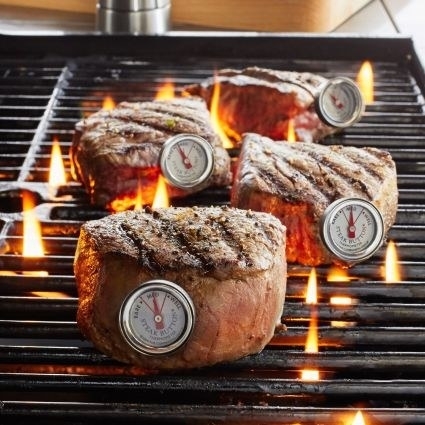 Get them from Sur La Table: the meat rub for $10 and the button thermometers for $15.96 (set of four thermometers). 23. A 4.4 cu. 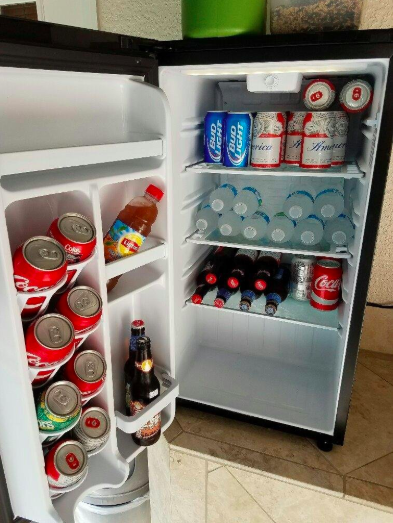 ft fridge with enough room to store plenty of beer, soda, and other cold fatherly beverages. Get it from Amazon for $189+ (available in multiple colors). 24. 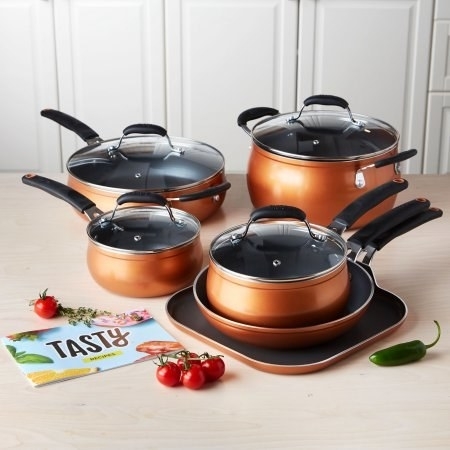 A cast iron cookware set that can be used for cooking anything – from roasts to cakes, biscuits and breads. Plus, you can use cast iron to cook over the open fire! Camping trip, here we come. Get them from Amazon for $47.30. 25. 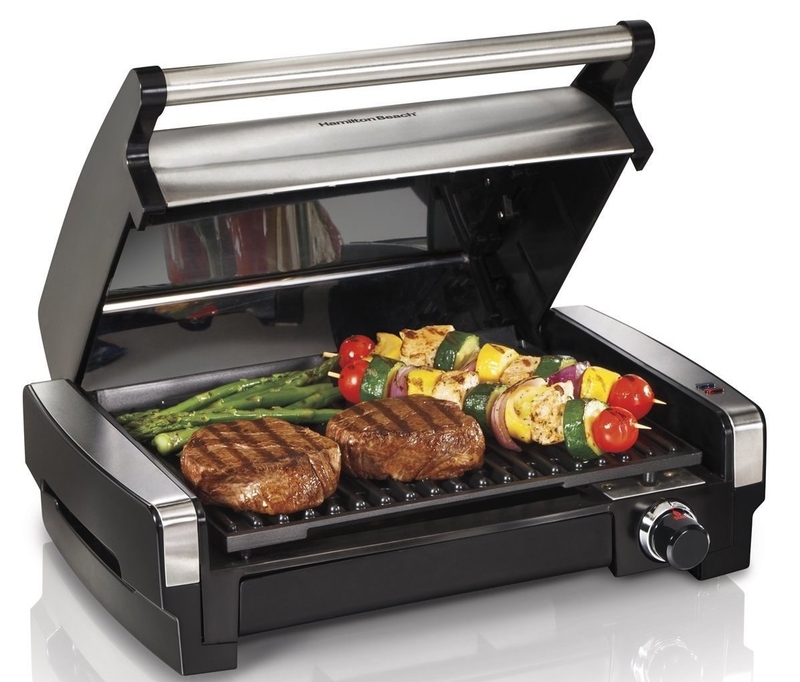 A well-vented indoor grill for any dads in the city who miss cheffing it up outdoors. 26. 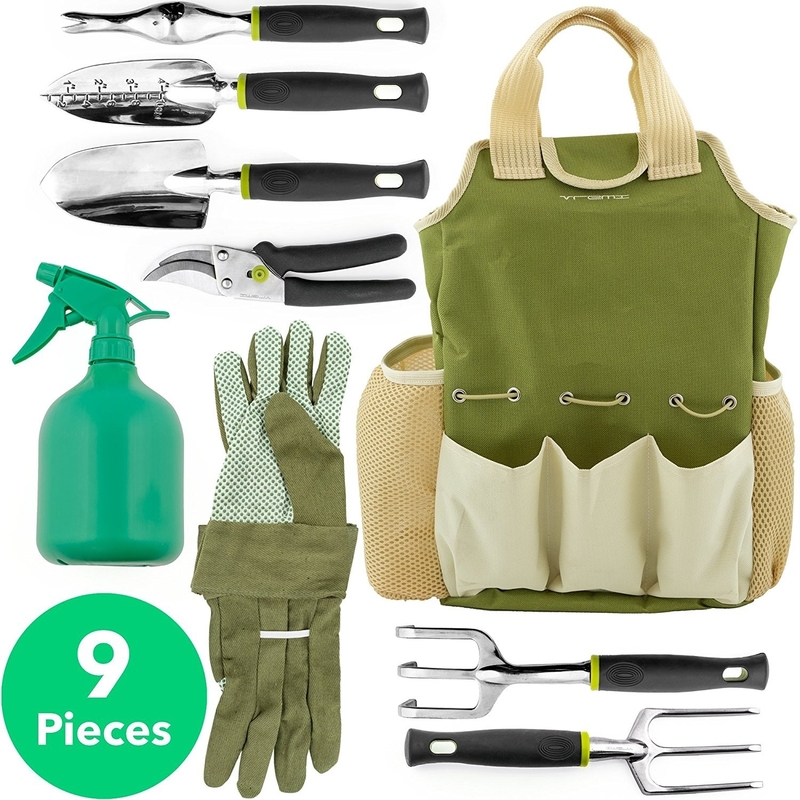 A nine-piece garden tools set your favorite father would happily be caught off ~gardening~ with. 27. And a bamboo bee house that might bring all the bees (and therefore pollen) to the garden. 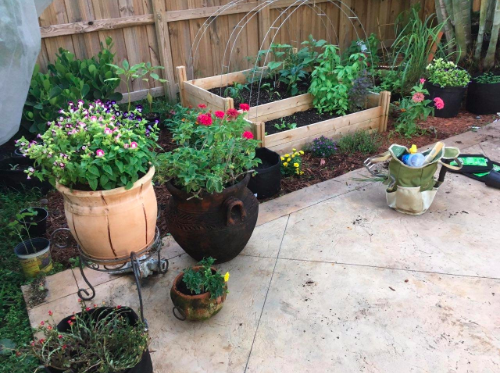 More pollination = more plants 🌺. 28. An apron to let dad get his *Hans* dirty in the kitchen (but keep the rest of him clean). Get it from Amazon $19.97. 29. A 13 Oz mug so you can subtly remind your favorite father how much he rules. 30. A DIY kombucha kit for those dads who have a big need for kombucha, but also have big complaints about how much it costs at the health food store. What you get: Choose from new home-brewer or experienced home brewer kit, and you'll get fair trade black and green tea leaves, preservative-free dried fruit, exclusive monthly recipes, and a SCOBY and gallon jar for new brewers. Why you'll love it: Kombucha is a delish beverage loved by many dads that is made with fermented tea. And it is not that difficult to make! Now your fav. dad can brew his own Kombucha instead of paying high prices for it in the health food store. Get it from Cratejoy for $29+ a month (subscriptions automatically renew each month, but can be cancelled at any time). 31. And a whiskey appreciation kit filled with luxury grub and personalized gear your dad will totally show off. Your dad will think this is really ~neat~! Get it from Man Crate for $149.99.